On a Disney Cruise Line ship, the fun of sailing meets Disney storytelling in unique ways no one else can do. So when we found out about the newly reimagined Disney Wonder, we were blown out of the water! According to Theron Skees, Portfolio Creative Executive, Walt Disney Imagineering, the cruise ship’s stem to stern refurbishment is the largest in the Disney Wonder’s history. “Every space on board has been enhanced,” he says. So what amazing new things will you discover on board? Here’s a peek through the porthole at what’s new. Undoubtedly, the minute you unpack your bags, the kids are scrambling into their Disney bathing suits. Head to the new water play areas where you‘ll find splashy interactive fun at the Aqua Lab, including the scream-worthy new Twist ‘n’ Spout water slide. Adults can get their kicks zooming down it, too. Have little ones? Now toddlers can splash to their hearts’ content at Dory’s Reef a new space created just for them. Kids will find some memorable characters from the hit Disney movie Finding Dory, along with fountains, bubblers, pop jets and a water curtain inspired by the East Australian Current. Which, if you remember your movie trivia, was used as a superhighway carrying Marlin and Crush along the east coast of Australia. When it’s time for youngsters to take a break from the water, they’ll find tons of fun in the Oceaneer’s Club from a new Frozen Adventure at Wandering Oaken’s Trading Post, to Andy’s Room complete with a Slinky Dog® slide and the new Marvel Superhero Academy where Spidey and Captain America train kids on how to be a superheroes. Older kids will enjoy the Oceaneer’s Lab where they can play games, get animation lessons and even use ship simulators to try piloting the Disney Wonder. Tweens and teens have their own spaces, too: the refurbished Edge and Vibe complete with DJ and dance floor, arcade and video games and more. We just have one word of caution. You may not be able to get your kids to leave the fun space in time for dinner! And speaking of dinner . 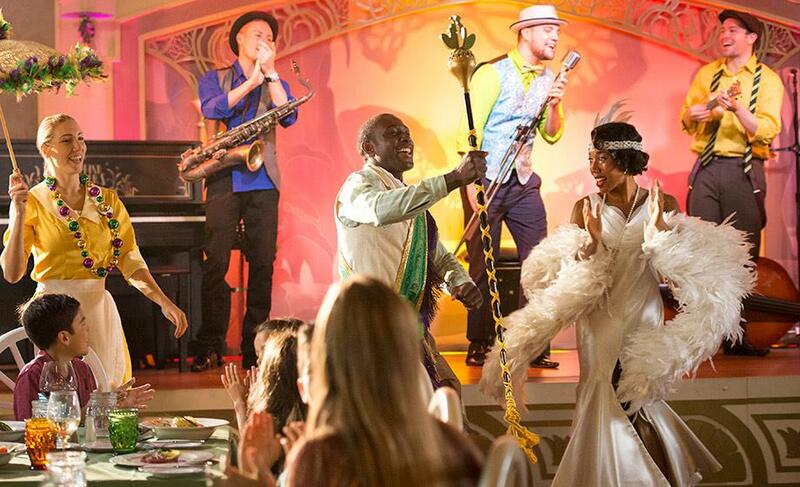 . . you’re going to love the new Tiana’s Place restaurant, themed to look like her restaurant in the film, and complete with a live jazz band, and Tiana’s Bayou Bash, where Tiana and her friends parade around the restaurant. But wait a sec – how about you? Not to worry, Disney Imagineers have taken care of adults, too. “We’ve completely reimagined After Hours, our adult district,” says Christiaan James Abbott, Director Disney Cruise Lines Operations & Creative. Check out Azure, the new nightclub where you can relax while feeling as if you’re under the sea. And you’ll have to visit the Crown and Fin, a proper English Pub. “It’s a warm, charming spot for Guests to taste fantastic English brews, watch sporting matches and join in games,” Abbott says. “Everything we do is about surprising and delighting our Guests,” Skees concludes. “We listen to what Guests tell us they want then put that knowledge to work creating new wonders on all our ships.” Obviously, the Wonder is no exception! Cardmembers, be sure to check out the full list of perks that await you on the open seas. Bon voyage and happy sailing!